5 CDs. 5:45 hrs. Listening Library. Jan. 2018. $45. ISBN 9780525526094. digital download. 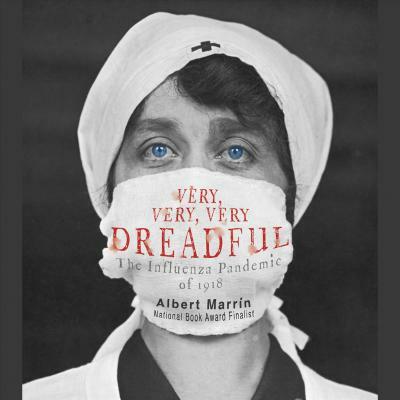 Gr 7 Up—The influenza pandemic of 1918 directly killed or contributed to the deaths of 50 to 100 million people worldwide, and not only the very old and very young. Enlisted men and people in their 20s were surprisingly susceptible to the mutated H5N1 strain that quickly spread via troop ships, prisoners of war, and crowded living conditions. Listeners journey with Marrin, from early human interactions with the virus, through hygiene innovations (handwashing; covering a cough) to the rat-infested trenches and disease-ridden barracks of World War I. Marrin's careful research is never dull, and his details of episodes of bird flu and swine flu since 2000 make it clear that dangerous flu viruses still exist. Marrin combines science, detective work, the history of medical innovation, and just the right amount of ick factor for middle and high school students. Narrator Jim Frangione speaks with an enthralling gravity befitting the subject matter. Clear and expressive enunciation does service to this fascinating story. VERDICT Very, very, very interesting. An ideal nonfiction selection for middle and high school.